The good news is, there are ways to minimize the impact these hormonal mood swings have throughout the pregnancy. Here, you’ll discover everything you need to know about the causes, treatment of pregnancy mood swings and when to seek advice from a doctor. What Causes Mood Swings During Pregnancy? There’s actually a few reasons you can suffer with pretty extreme mood swings during pregnancy. Hormonal changes are the most obvious cause, as estrogen levels soar and other hormones take a back seat. If there’s any drastic changes in hormone levels, it can have a direct impact on your neurotransmitter levels too. These are basically the things responsible for regulating the mood. Hormonal mood swings tend to occur more frequently during the first trimester, then again during the third trimester. Pregnancy can be a worrying time, regardless of whether it’s your first child or not. When you’re extra-tired, you’ll also feel a lot more irritable and anxious. Then there’s the misery the other side effects of pregnancy can cause which can lead to you feeling emotional and fed up. There’s so many reasons mood swings can occur, but whatever the cause, they can be pretty tough to deal with. Forgetfulness And Tears – During the first trimester, you’ll notice you start to feel a lot more emotional than usual. Tears and forgetfulness are pretty common mood swings experienced during this stage. You may even find the tears last just 10 minutes, then you’re feeling happy again. This is totally normal, though it can understandably be pretty worrying if you’re usually on top of your emotions. You’ll also notice the tears can come from pretty silly reasons. It’s just your hormones but crying over the smallest of things can definitely start to get annoying! It can also make you feel like you’re losing your mind, thinking there’s something wrong with you for crying over absolutely nothing. Again, this is a common feeling, but rest assured it’s normal. As well as the tears, you’ll also likely experience forgetfulness. Commonly dubbed as “Baby Brain”, don’t be surprised if you start forgetting even the basic things. Down to hormonal changes, forgetfulness is common but it’s also temporary. So, no need to worry you’re starting to get dementia during your pregnancy! Sudden Depression – One of the worse mood swings experienced during pregnancy is sudden depression. It can come out of nowhere, or sometimes be triggered by nerves over what will happen once baby arrives. This depression can be mild or severe. It may just feel like a wave of sadness which passes quickly, or you may find yourself not wanting to get out of bed. It can be really difficult to deal with sudden depression, but it is usually a very temporary feeling. Excitement – Of course, not all mood swings are negative. There’s going to be times you’re so excited about the pregnancy and getting to meet your baby. However, even this excitement can be overwhelming; especially if it’s following a sudden bout of depression. Anger And Irritability – Again, anger and irritability typically arise during the first and third trimesters. The change in hormones, along with the uncomfortable side effects of pregnancy can make you feel a lot more irritable than usual. The trouble is, if the anger and irritability is extreme, it can place pressure onto your relationship. This in turn can make the experience a lot more stressful and difficult to deal with. Nesting – One of the final changes you’ll notice at some time during the third trimester, is the urge to nest. You’ll find yourself wanting to clean anything and everything. This is actually similar to what many animals experience when the birth draws near. It’s basically your brain helping you to get ready for baby’s arrival. 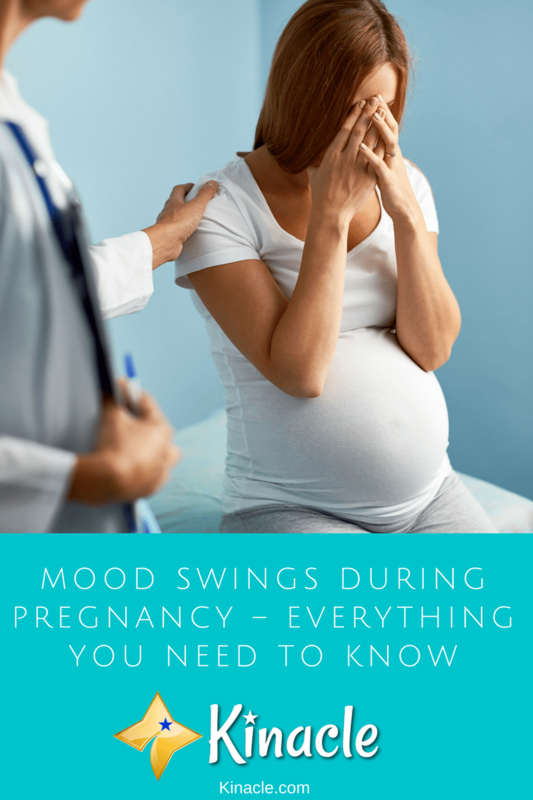 These are the most common mood swings you’re likely to experience throughout the pregnancy. On their own, it’s possible to quickly overcome and manage them. However, if they arise around the same time, facing so many different emotions at once can prove to be overwhelming. So, is it possible to prevent these mood swings from happening in the first place? Can You Prevent Mood Swings In Pregnancy? Unfortunately, there’s not much you can do to prevent these mood swings from occurring; especially if they’re down to hormonal changes. During the first trimester, you could try and rest as much as possible to prevent yourself from becoming over tired. Other than this however, it’s unlikely you’ll be able to stop yourself from having mood swings completely. It’s all part of the pregnancy experience and some days will just be a lot more manageable than others. While you may not be able to prevent mood swings, there are ways you can treat them. Taking it easy is by far one of the best tips you can follow. You’re going to need a lot of rest and relaxation throughout the pregnancy so resist the urge to get as many jobs done as possible before baby arrives. So, be sure to set aside time to relax every single day and get as much sleep as possible too. This will especially help with fatigue. Seeking support is also recommended. Understanding you’re not alone and seeking advice from other women experiencing the same issues can really help. You’ll find a lot of forums online and even local support groups you could attend. Talking about your emotions can prove really effective at getting them out and preventing them from overwhelming you. Finally, doing things which release stress is also going to help. This could be ensuring you’re eating healthily, getting daily exercise, listening to relaxing music and enjoying a nice long bath. The less stressed you feel, the easier the mood swings will be to manage. While the above advice can help to manage most mood swings, some pregnant women do unfortunately experience severe symptoms. If you notice that your mood swings are getting worse and they’re lasting for longer than a coupe of weeks, it’s advisable you contact your doctor. Also, your mood swings shouldn’t get in the way of your everyday life. So, if you find that anxiety or depression for example, is really stopping you from carrying out everyday tasks, it’s a good idea to speak to someone, such as a counsellor. Not only will this benefit you, but it will benefit your baby too. Research has actually discovered that mental health issues in pregnant women which aren’t treated, can go on to affect baby too. Overall, mood swings are to be expected and some days they may feel unbearable. However, it helps to know that they are only temporary and help is available if they become too much for you to handle.